My name is Chakor Ogidigbo, I am married (blushing) to a wonderful man (bless God) and I have two beautiful and amazing daughters. I remember being underweight during my undergraduate days, people who later turned out to be my closest friends confessed to me how they hated being compared to my kind of figure (you may call it “lepa shandy” or bonga fish). No, I don’t think it was that bad, at least not in my eyes. But I made sure I ate a bar of mars chocolate everyday in order to gain some pounds, although I didn’t care that much, since I wasn’t slim or skinny because I wanted to, I was just naturally that way. For crying out loud I was only 18 years old. That should at least justify my 45-50kg weight right? Fast forward to September 2010, I started hearing comments like “Chakor you are putting on weight“, I often just smiled, of course my clothes were not lying too, they were slightly getting tighter. Not sure if I was really happy about that, but I was okay. If I wasn’t happy it was because I was not yet pregnant, at least weight should come when I’m pregnant. Well, later on in 2011, I gave birth to my first child and after birth weight was 69 or so. I started becoming conscious of my weight in 2012, I discovered my cheeks were getting rounder, clothes getting too tight, no, they weren’t fitting anymore. I gave out most of my lovelies thinking I was never going to fit into them. I had to get a new wardrobe. Suddenly I was no longer a lepa, no longer fell into the slim spectrum. Now, here I am again in 2014, I have lost those extra pounds, infact all my clothes are now too big, my jeans are dropping off my waist, belts have become a necessary accessory to have. I now weigh 55kg, after my second child. So how did I get here? Well, I had read different write-ups on exercising, eating healthy, staying healthy and all that one needs to take care of our body and to live healthily long. I have been so inspired by people around that are making efforts to live healthy. My friend Tola is my greatest inspiration. God has obviously been my strength all through. Joggling a family life, an 11month old baby, a 3year old toddler is indeed a great challenge to achieving this but somehow I was favoured to pull through it all. 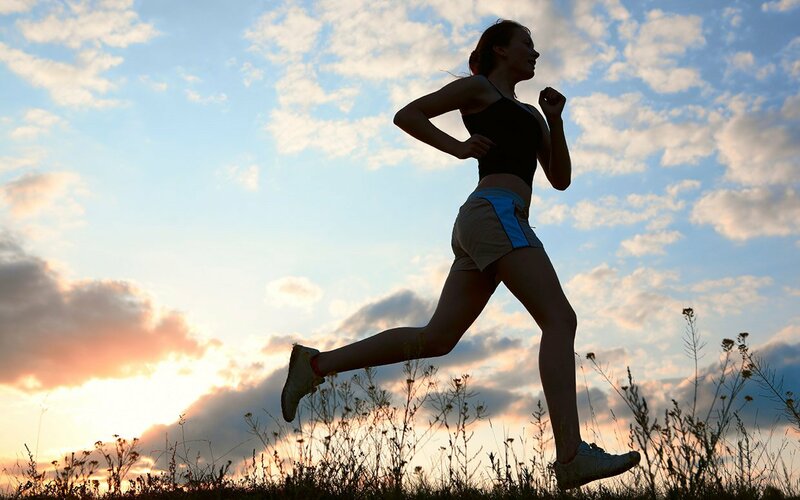 I began with a 30minute jog, 5times a week, early in the morning. I began in November of 2013, 3 months after I had my second child. I liked what I felt. I was more energized for the day. I didn’t see weight loss immediately but it later came. Then I took out sugar from my diet, not completely though, I reduced it to very minimal. I then took out beverages (chocolate drinks, fizzy drinks, artificial juice etc).I started taking fruit juices I made myself. I had a glass of fresh orange juice most days. Other days I would just generally mix watermelon, apple and oranges for variety. Initially, for food, I was actually eating healthy but in large portions, so I reduced my portions and ate more veggies. You can never have too much vegetables. Carrot, cucumber,onions, lettuce and cabbage were always in my platter. I stopped eating eba and switched to wheat meal instead. It is lighter and a lot more healthier. And for soups I made fresh okra and flaked fish inside it. Also cut off egusi and ogbono because of both the oil it contained and the oil needed to cook it. Big NO to fried foods. Pretty much everything that can be fried can be grilled. So I grill or roast. I am very conscious not to eat in between meal junk, if at all I have to eat something, I go for fruits. You can make them into smoothies or salads. The journey so far has been amazing. My family has benefited from this new healthy lifestyle. I cook good, healthy food for the family, we take enough water and fruits. I feel healthier, I look better and I believe I have inspired a few to work on their bodies for good healthy living. 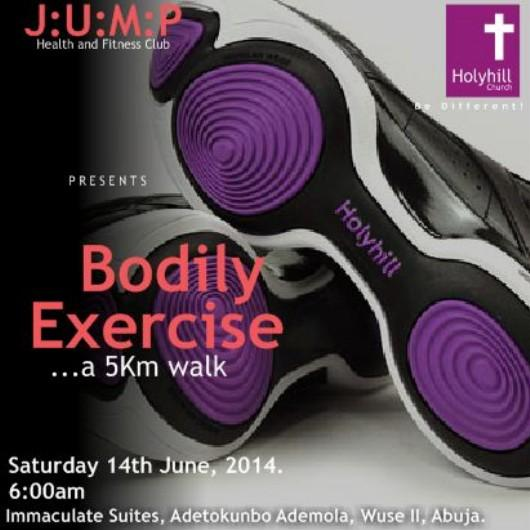 So if you live in the city of Abuja, join me for our next J.U.M.P 5K at City Park Wuse 2 on the 16th of August 2014 by 7am prompt. A 5km bodily exercise that members of HOLYHILL church come together to participate in. You are allowed to come with your friends and family too. It will do your body good, believe me. Previous Post INTRODUCING – THE LOVE OF MY LIFE SERIES.